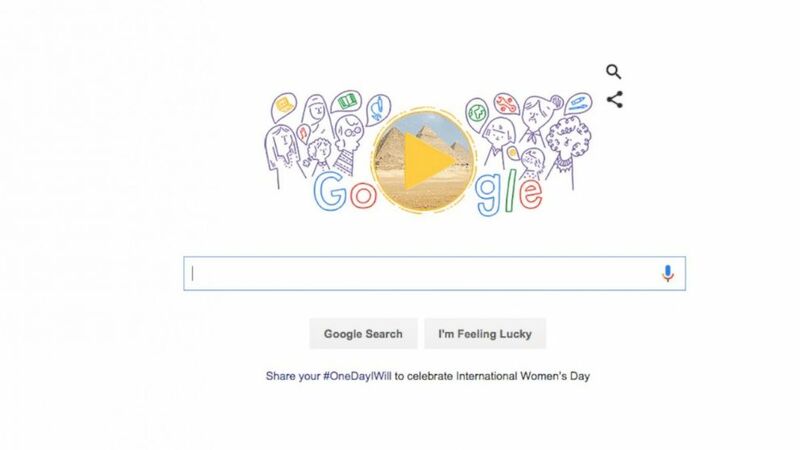 Google asks women to share #OneDayIWill message. camera (Google) Google's doodle, pictured, celebrates International Women's Day, March 8, 2016. Google's doodle today celebrates International Women's Day by asking women around the world to share their aspirations. The search engine giant visited 13 cities on five continents and asked 337 diverse women to complete the sentence "One day I will..."
"Over the years, Doodles have commemorated the achievements of women in science, civil rights, journalism, sports, arts, technology and beyond," a blog post from the company said. "It’s always an honor to pay tribute to women who have changed the course of history, sometimes in the face of seemingly insurmountable obstacles. But for this year’s International Women’s Day, we wanted to celebrate the Doodle-worthy women of the future." As the women in the video share their dreams in their native language, animations reflecting their hopes show on the screen. There's an astronaut, a dancer, a scientist, politician and more. Google is also inviting women around the world to share their dreams on social media with the hashtag #OneDayIWill.